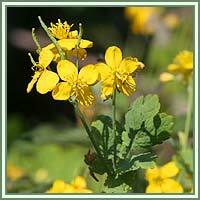 Habitat: Greater Celandine is native to Europe and western Asia. It can be found on damp ground, banks, hedgerows and alongside walls. 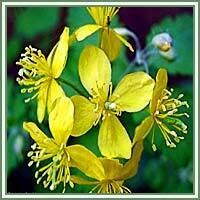 Description: Greater Celandine is a herbaceous, perennial plant. It has a fleshy orange taproot and an erect, hairy stem growing up to 120 centimeters high. A rosette of basal dark green, lobed leaves is dark green in color. Leaves are 30 cm long. Flowers are bright-yellow and four-petaled, growing from the terminal clusters. Flowering starts in late spring and continues throughout the summer. Seeds are pin-head size and black, borne in a long capsule. Useful components: Latex and isoquinoline alkaloids (coptisine, berberine, chelidonine, sanguinarine and chelerythrine). Medicinal use: Greater Celandine is considered to be a mild analgesic, cholagogic, antimicrobial, oncostatic and sedative. Recent studies suggest that the plant could be very useful in relieving gallbladder spasms, and that it can act as a gallbladder stimulator. Furthermore, Greater Celandine has shown to be very effective in calming the abdominal disturbances, and relieving symptoms of indigestion, such as abdominal cramps and nausea. Its external use is very effective against warts and can be beneficial in cases of small open wounds.